Rhode Island may be the smallest state in the union, but its picturesque maze of bays, inlets and islands gives it more than 400 miles of coastline. And this summer, there are several new or noteworthy ways for couples to enjoy the Ocean’s State’s abundant access to, well, the ocean. Ocean House Reborn on the spot where the original building – the last of nine 19th-century grand wooden seaside hotels that once lined scenic Watch Hill – this cheery yellow $140 million replica (pictured above), opened in early June, incorporates many of the old building’s circa-1868 details: The lobby fireplace was deconstructed stone by stone and reassembled, the multi-paned windows separating reception from the lounge were carefully cleaned and re-installed, and the original lobby chandeliers were repurposed in an atmospheric meeting room. Everything looks and smells impeccably fresh and new, but with an architectural aesthetic that is clearly a nod to its tidy Victorian past. Art lovers, in particular, will enjoy strolling the public spaces, which are lined with hundreds of beautiful paintings and illustrations, many a part of the hotel owner’s private collection and others sourced specifically for certain areas (about 60 are available for sale). But it’s the 49 guest rooms (and 23 private residences) that best blend old and new – with clean, seaside color palettes of yellow, blue, turquoise and cream complemented by luxe Italian bed linens, flat-screen TVs, and spacious marble bathrooms with deep soaking tubs. More couple’s time can be had at the 12,000-square-foot OH! Spa, which uses regionally-inspired organic products, and Seasons fine-dining restaurant, with its fresh and always evolving farm-to-table cuisine. Lunch is also available at the more casual Seaside Terrace and Dune Cottage grill. From $495, July and August and $430, September and October. Hyatt Regency Newport Newport may be known for its Gilded Age mansions and its mega-yachts, but thanks to this 257-room property’s $35 million refurbishment in mid-2008, you don’t have to be a millionaire to enjoy seaside relaxation in style. 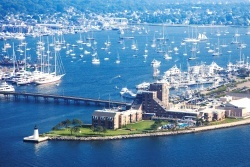 The Hyatt’s contemporary take on nautical-chic décor –neutral tones with soothing blues and grays and modern geometric carpets reminiscent of gentle waves – befits its location on Goat Island, surrounded by water smack in the center of Narragansett Bay (pictured at right). Rooms, especially those in the Captain’s Quarters, are large and airy, while the sundeck of the Five33 Lounge and poolside Pineapples on the Bay, overlooking a lush green Great Lawn and the Newport Bridge, are ideal spots to sip cocktails and enjoy stunning sunsets (all summer, there’s complimentary live music Friday through Monday nights). Other romantic rendezvous spots include the Stillwater Spa and an outdoor fire pit ideal for toasting marshmallows and making s’mores. From $271. 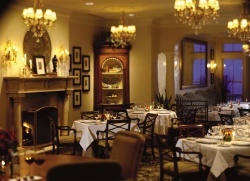 The Chanler If you can get away mid-week (Monday to Thursday) in July or August, one of Newport’s most romantic and luxurious inns still has some availability at rates starting at $599/night (weekends, if available, are considerably pricier). Located above Easton’s Beach at the start of the scenic Cliff Walk, The Chanler features 20 rooms lavishly and individually decorated with ultra-comfy beds, amazing showers and deep soaking tubs (request a complimentary butler-drawn bath). If you already have a room booked in Newport, at least enjoy dinner the hotel’s wonderful restaurant, The Spiced Pear (pictured at left), where chef Thomas Duffy’s modern American cuisine features fresh takes on classic New England ingredients. Splurge on the Ultimate Romance Dining Experience, which features a personalized seven-course meal (and a three-ounce wine pairing per course) plus a dozen roses ($420 per couple – reserve at least 48 hours in advance). Start planning your next getaway with our Romance Travel Deals.